“Ho! 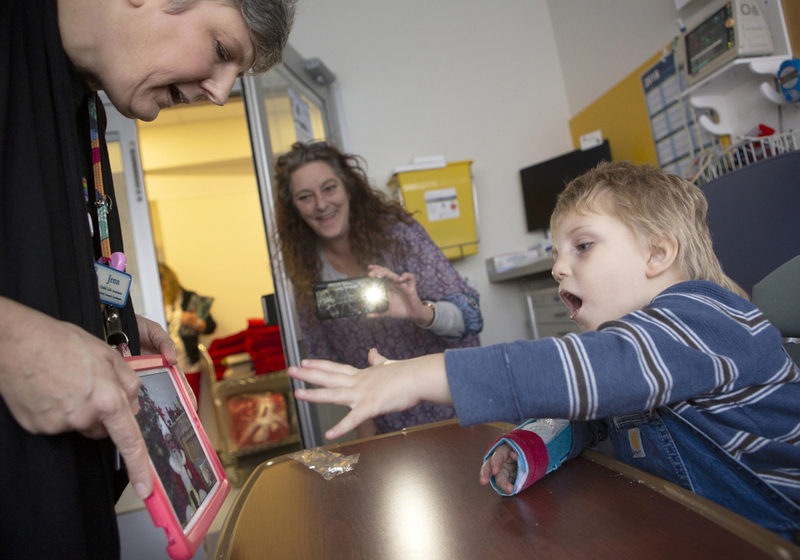 Ho!” calls out 4-year-old Zeyke Hockenbroch as he reaches out during to Santa Claus during St. Nick’s virtual visit to the kids at the Penn State Children's Hospital - Pediatric Hematology-Oncology and Infusion Clinic on Friday, Dec. 7, 2018. The Child Life Program and Cisco Systems arranged for the direct connection between the North Pole and the Children’s Hospital, so children could tell Santa what’s on their wish lists via video monitor with a web-enabled camera. As Santa Claus works all month to oversee toy manufacturing and sleigh maintenance, he took some time out of his packed schedule today to virtually visit with patients at Penn State Children’s Hospital. The hospital’s Child Life Program and Cisco Systems arranged for the direct connection between the North Pole and the Children’s Hospital, which allowed children to tell Santa what’s on their wish lists via video monitor with a web-enabled camera. The visit included some room-to-room visits that allowed patients to talk with Santa on an iPad.